I can honestly say that my wedding was like the end of Walt Disney’s Cinderella. Okay, there were no talking mice, and I did not have to go around the world with a shoe looking for the girl whose foot would fit inside. 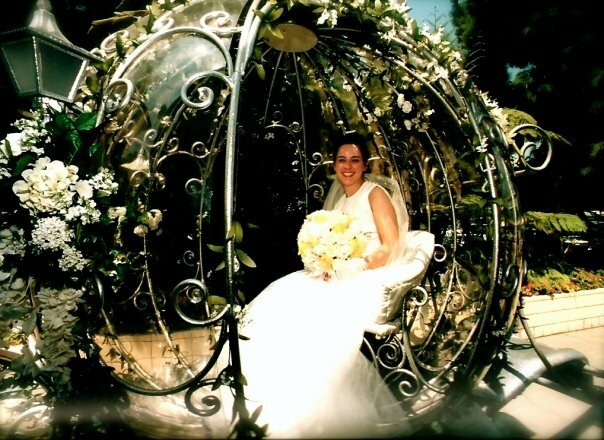 But I did leave my wedding in a pumpkin-shaped crystal coach with white horses, a footman, and a crowd of people around the Disneyland Hotel taking pictures of us, all the while hearing “A Dream is a Wish Your Heart Makes” playing around us. Those are the words Cinderella sings at the beginning of her movie. I sincerely believed them, because I was certain God had not created me to be alone. I was certain that a wonderful, warm, witty, beautiful, vivacious and amazing woman was out there, looking for me–just like I was looking for her. It took awhile to find her. Like Cinderella’s prince, I had to search the kingdom to find the girl who was the right “fit.” Girls I had dated previously and fallen in love with, well–they weren’t “right” for me. But it turned out that Robyn was. When I’d almost given up on the search, she was there. She was there at The Disney Store, looking beautiful in spite of the turquoise blue sweater and khaki shorts she had to wear to work each day. She was there with an infectious life, a beautiful smile, and eyes that twinkled as we sang along with “A Whole New World” from Aladdin while stocking the store. We’ve been married now for 12 years. It’s not always easy–the Disney movies don’t always show that part–but it’s been an adventure like no other. Full of laughter and tears, full of forgiveness and fun. It’s been 12 years of hard work, raising kids, growing a family, finding out who we are and who God created us to be. But it’s true. A dream is a wish your heart makes. And 12 years ago, at Disneyland, my wish came true. My Disney princess didn’t disappear when the movie ended. My Disney princess became my best friend, my greatest love, and my wife.